Melanoma is the number one cause of death among all types of skin cancer, according to the Center for Disease Control and Prevention. It was also a prevalent issue that affected MassMutual Manager Manuel Amezcua on a personal level when his wife, Samantha was diagnosed with melanoma five years ago. “It was a difficult time when my wife was diagnosed because at the time she was three months pregnant with our son,” said Amezcua. “Thankfully, our son is healthy as is my wife. She has a long history of skin cancer going through her grandparents and great grandparents. Since she was young she always knew she was at risk and it was rather unfortunate that she was diagnosed with melanoma when she was pregnant. So at the time we started looking to see what we needed to do to become educated and aware of how to work through that time on behalf of my wife and what she was going through at the time.” Quickly after diagnosis, Amezcua and his wife joined the Melanoma Research Foundation, the largest independent organization devoted to finding effective treatments for those afflicted with melanoma. “It does not matter what our ethnic background is or our socioeconomic status is, if you have skin and you do not take the necessary steps to protect your skin from excessive exposure to the sun, you are at a significant risk, a real risk,” said Amezcua. “There are so many misconceptions out there about melanoma. I, for one, thought it was solely hereditary or I thought because I am darker skinned I am not at risk, but Latino are affected by melanoma just like any other ethnic group in the world. We need to stay on top of our health.” Luckily for Samantha, she maintained a great relationship with her dermatologist and checked her moles every six months. After diagnosis, she receives checkups every 90 days, which is key to staying on top of your health, said Amezcua. “I would advise people, especially Latinos to seek out a dermatologist to get checked. If you do not have one, ask someone, ask a friend, do research, but it is important to protect your skin and get examined.” A passion for community involvement, Amezcua and his family work with the Melanoma Research Foundation to help educate others on a larger platform as to what individuals can do to get examined. 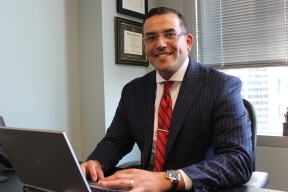 Amezcua also volunteers his time at various organizations, such as Posse Chicago, Children’s Memorial Hospital, Feed My Starving Children, and is a member of the NAIFA Chicago Region, and City Club of Chicago. “It is vital that we continue to give back to our community and help others. That is something we as a family truly believe in; to come together and champion a cause that will change lives.” For more information about melanoma or about the Melanoma Research Foundaiton, visit www.melanoma.org. © 6313 Chicago Hispanic Newspaper, Lawndale News, Hispanic Bilingual Newspapers, Su Noticiero Bilingue. All rights reserved. XHTML / CSS Valid.